This is so good, especially with homemade soups or any Mexican meal. Sift cornmeal, salt, and baking soda together in a large mixing bowl. Add milk, eggs, vegetable oil, cooked rice, corn, onion, Cheddar cheese, and jalapeño pepper. 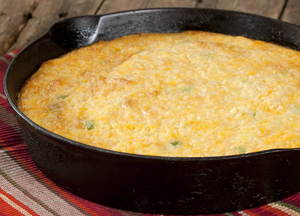 Pour into a large 12-inch cast iron skillet which has been greased and sprinkled with cornmeal. Bake in a 350 degree oven for 40 to 45 minutes or until brown and set in the center.